[C] [(V)]: If "Fate Healer, Ergodiel" is in your Soul, this gains +1000 Power. 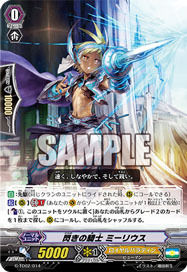 [A] [(V)]: [(2), Discard a "Cosmo Healer, Ergodiel" from your hand to the Drop Zone] When this hits a Vanguard with an attack, you may pay cost. If so, choose a card in your Damage Zone and Heal it. Even if you become a fragment of a stardust, I shall heal you.